This is the first of several blog posts about travelling with your service dog. Wherever my dog goes, I always bring along a bag packed with supplies: water and a collapsible travel bowl, some treats, and a first aid kit made specifically for dogs. You never know when a first aid kit will come in handy, for you or your dog. A dog first aid kit will contain common supplies like gauze, tweezers, and a cold pack, as well as an emergency guide to treating common canine injuries. Some of the supplies may also serve double-duty; gauze can be wrapped around a dog’s snout to act as muzzle if necessary. 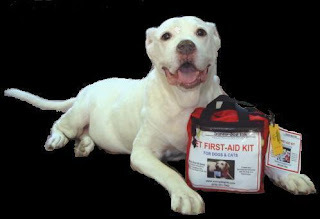 A canine first aid kit is available at workingservicedog.com. I have added some extras to my first aid kit: a calming product like Rescue Remedy Pet, hydrogen peroxide to induce vomiting, and a children’s antihistamine in case of allergic reaction. Check with your vet about proper treatment and dosing for your dog’s weight. Keep in mind that medicines and some of the supplies in the kit may expire, so check the kit every year and replace contents as needed. Be safe and prepared out there!